First, the good. Getting to spend the day with great friends was priceless! 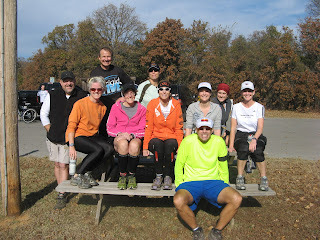 It was a beautiful day at Grapevine Lake for the 15th annual Rockledge Rumble. Woke up to 47 degrees, light breeze and sunny sky. 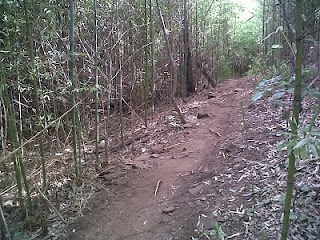 Dallas had gotten some rain the previous couple of days but the trails are pretty sandy and were in great shape. The high was expected to reach the low 60's. Just perfect conditions for a trail race! Tom Krull does a phenomenal job as RD and everything runs like clockwork. There are great volunteers and the race is honoring our wonderful veterans. We woke up at 4:30 to get ready, packed up and eat our peanut butter english muffins. It's about a 45 minute drive from Rockwall to Grapevine and once we got there we got a close parking spot and collected our race packets and met up with some friends. We were thrilled with the race shirt! Last years shirt was great, this one was even better. Patagonia Capilene with a front zipper and awesome design and logo. Love this race! We hung out in Mike's truck since it was a bit breezy and chilly standing around waiting. The 50K'ers were off and we were next 15 minutes later. After some quick instructions and a prayer, then a countdown from one of the veterans we were off! There is a short 1/2 mile paved section before you hit the single track and we tried to stay towards the front to middle of the pack so that we weren't stuck behind slower runners once on the single track. The first couple miles flew by and I felt great. I kept hearing the unmistakable sounds behind me of people falling and other people helping them up and asking if they were ok so I knew I needed to be really careful and watch my step. There were lots of freshly fallen leaves on the trail that hid the sharp rocks and the little stumps underneath. At a little past mile 4 it happened. I was running one second and heading face first into the ground the next. I had caught my foot on a looped root and came down hard on my left knee. The pain was immediate but I jumped up and tried to run it off since there was a group of people right behind me and I didn't want to slow them up. I could feel my knee swelling and feeling some sharp pain in my patellar tendon. Right about that time the plantar fascitis started flaring up again too. That's when mentally I started to check-out. I'm not sure why, but the wheels started coming off and I wasn't sure how to get myself back into my race. I went from running down the trail enjoying the scenery and enjoying the race to just trying to figure out how I was going to make it another 17 miles and just be done. My friends did a good job of setting a good pace and that kept me going forward. Until my friends started falling too. They had some bad falls and even some blood. We made it to the 10.1 mile turnaround and after that we all started slowing down. Holly had four bad falls, Doug had two or three and it just got hard to even walk, much less run. Holly's first marathon is coming up in three weeks and we just decided to take it very slow and easy rather than risk a fall that would jeopardize her upcoming marathon. I think I did a pretty good job with hydration and carried two small handhelds throughout the race which I refilled at the aid stations. I started out with Gatorade but the aid stations only have Heed which I just can't drink (yuck) so I mostly drank water and took an S! cap every 30 minutes or so. 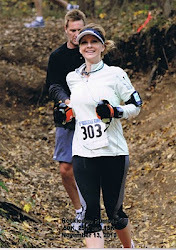 Ate some potato chips, pretzels and PB&J sandwichs at the aid stations. The last three miles were excrutiating on my foot. If I could of dropped somewhere, I would have. 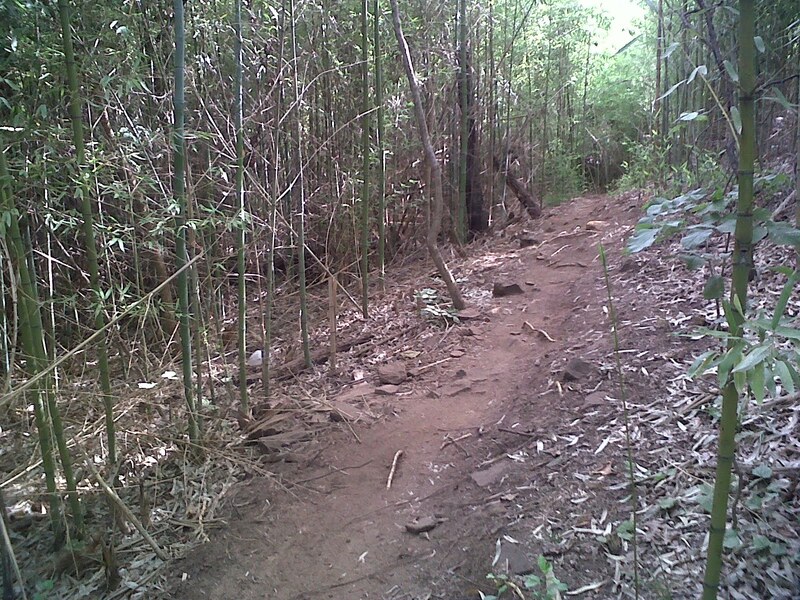 It's lucky for me there were no aid stations along that section or I would of asked for a ride back to the start/finish. We finished the race though and got our handmade ceramic medallions. (One of the special finishers awards this race offers that I think is so cool!) Now I have two! About an hour and 15 minutes slower than we expected we would, but we finished. Oh, and another thing I forgot to mention is that although this race is called a 30K, it's actually a little over 21 miles, which is almost a 35K. After enjoying some of the great red rice and beans at the pavilion, I headed back to Oklahoma. It was a long three hour drive home. I stopped at a gas station for some coffee and Advil, pulled off my shoes and socks and assessed the damage to my feet. A couple of toenails are probably goners and I had a few blisters and some swollen feet. Put on my compression socks and got back on the road. Now with a good nights sleep I am feeling much better. Not nearly as much soreness as I expected although my knee is pretty swollen and tender. I have a much needed massage appointment tomorrow and can't wait. The plan is to take some time off and let my knee and plantar fascitis heal. My spirit was so broken after this race that I cried when I was finally alone and in my car after the race. But a friend said something that I'll always remember. He said, "It's not the easy runs that make you great, it's the tough ones." How right he is. So I'll be back next year to run that 30K and with some experience under my belt now for it hopefully it will go much better. I'm already thinking of what I can do differently and how to better prepare for it mentally. I thought my training was good and I had plenty of long trail runs under my belt but I am going to work on not going out so fast. Next race will be slow and steady with the distance I have to go in mind. Every race I definitely learn something new and hope to run smarter the next time. Rockledge Rumble 30K is fast approaching (Saturday), and I have developed some plantar fasciitis. Ruh-oh! I noticed it during my long run on Saturday and my left foot has been achy and sore ever since. Especially when I first get up in the morning. So no running for me this week. I’ve been icing it several times a day and taking some Traumeel which is a natural anti-inflammatory. Does anyone know anything else that I should/could be doing for it? It’s hurting right along my arch and a little ways up the side of my foot towards my ankle. I’ve ran 24 miles so far in November and I’ll have 21 miles on Saturday but it looks like I might have a little catching up to do after this week for my November 100 mile challenge. Hopefully this PF will go away quickly. It doesn’t feel very bad yet, so I think there is hope?!?! A blogger friend, Thomas, has started a 100 Mile Challenge through DailyMile.com and I decided to give it a try. Participants have all of November to get to 100 miles. And I'm off to a good start with 7 trail miles tonight! I love challenges like this because I push myself further than I normally would. I had originally planned to run 4 miles tonight but upon figuring the numbers in my head so that I could average 25 miles a week for 4 weeks to reach my 100 miles, I realized that I should probably do 6 tonight. After running three loops at my favorite trail my mileage was at 6.4 miles. So I did the natural thing that someone trying to eek out as many miles as possible would do and ran an extra .6 miles to round it out at 7 miles! YAY! The plan is another 7 mile run and a 3 mile run this week, then a 9-10 miler this weekend. Next week I'll take it easy and just do a couple of short runs because next weekend is Rockledge Rumble 30K!!!!!! I've looked forward to running this race with Holly all year long. And the almost 20 miles I'll run at RR will help me reach the 100 mile goal as well. Let's run 100 miles together!